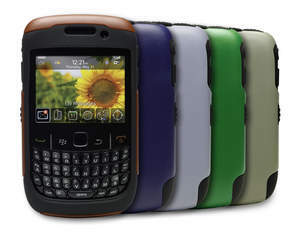 FORT COLLINS, CO--(Marketwire - April 20, 2010) - Expanding on the popular Commuter Series™ case line for the BlackBerry® Curve™ 8520 and BlackBerry® Curve™ 8530 smartphones, OtterBox™ introduces five colorful coverage options to keep your smartphone fashionable this spring. Find the perfect pallet for your personality by choosing from jasper red, zircon blue, ardoise slate, jade green and scapolite gray. "We work hard to keep up with the requests from our customers, and one of the most common has been for color," said OtterBox CEO Curt Richardson. "These new color combinations will be great for expressing individuality while still providing high-quality protection." All buttons and smartphone features remain fully functional through the case. Silicone corners help to dissipate impact away from the smartphone with added bump and shock protection. Cases include a cleaning cloth and installation card. Give your BlackBerry Curve 8520 or BlackBerry Curve 8530 smartphone colorful coverage this spring with new OtterBox Commuter Series color cases. *Commuter Series provides some added protection against bump and shock. Case is NOT protective against water. Find the perfect pallet for your personality and your BlackBerry(R) Curve(TM) 8520 or 8520 by choosing from the new Commuter Series(TM) colors: jasper red, zircon blue, ardoise slate, jade green and scapolite gray.